Lee LeeZardo and dancing colleagues have launched a new campaign for Pepsico’s SoBe Water, leading up to and during the Super Bowl. 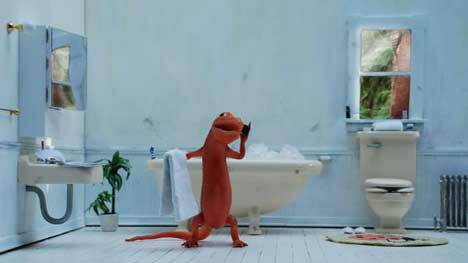 The first stop-motion animation teaser features the domesticated lizard (Gumby meets Geico Gecko) talking to his parents on the phone, warning them that he’ll be dancing naked with a super model during the first half of the game. What the teaser doesn’t tell us is that he’ll be joining Naomi Campbell to promote PepsiCo’s drink, SoBe Life Water. Lee and Donny, dancer from the 2008 Sobe Life Water Super bowl commercial, take a break to discuss girl problems. The Lee LeeZardo spot was developed at Arnell Group by Peter Arnell. The teasers and web site were produced at Mekanism, San Francisco, the team responsible for the Microsoft Clearification campaign. See Lee’s MySpace site at www.myspace.com/leeleezardo.